I just wanted to say a word of thanks to Bill for arranging a “meet and greet” for my daughter Kerri Roberts, her friend Carrie Ballentine and myself before the Vocal Band concert at the South Carolina State Fair. Kerri, her husband Brent and their five children are missionaries in Zambia. They had been home on furlough, regrouping before returning to the field with a different focus. Having been in the capital city for three years, their new assignment would be out in the bush, ministering to some 100,000 village residents. The chieftainess of these villages is a believer and has given them her blessing to minister to her people. Both Kerri and Carrie are talented vocalists, having served together on their home church’s worship team. They are also huge GVB fans, so when I learned that you guys were coming, I bought tickets. I was trying to savor every precious moment we could possibly share together before their return to Zambia. 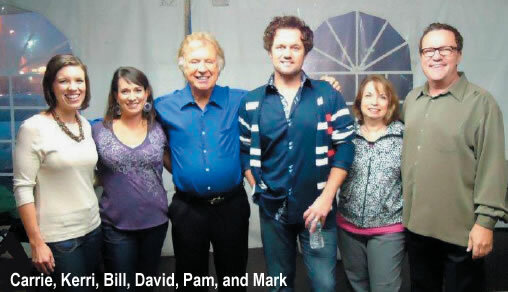 It was very special to us to meet with Bill, and then both David and Mark joined us for a time of fellowship. It is a special memory. Kerri, Brent and my five grandchildren returned to Zambia in November. It’s a whole different experience for them this time as they set up both home and ministry in such a remote location. Please pray for them. And pray for me, too. Separation from family is one of the most difficult aspects of serving on the mission field. Thanks again to Bill, David and Mark for taking the time to meet with us. It was most appreciated.